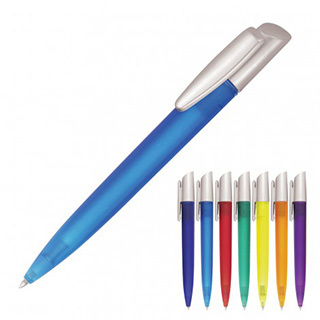 Funky futuristic styling and vibrant colours distinguish the Donna Ballpoint Pen. Can be pad printed to the barrel or clip as well as screen printed with your corporate logo or brand to create a stylish promotional gift with a variety of possible options. A quality twist action, retractable ballpoint delivers black ink from a precision Parker type refill with a 1.0mm nib and 1,000m capacity.